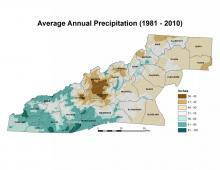 Western North Carolina has some of the most variable average precipitation in the southeastern United States. In fact, the wettest and driest points in Western North Carolina are separated by only 50 miles. Elevation gradients of the mountains contribute to the differences in precipitation, which can range from 100 inches to 36 inches per year. As an example, consider average rainfall in two towns – Lake Toxaway and Asheville – that according to the State Climate Office of North Carolina are the wettest and driest official weather recording stations in the region, respectively. Lake Toxaway, located in Transylvania County, has average annual precipitation of around 92 inches, and sits at the southern edge of the Blue Ridge Escarpment. Moist air lifted over the mountains drops heavy amounts of rain on this high-elevation town; nearby areas are wet enough to be considered rain forests, and waterfalls abound. In contrast, the city of Asheville, in Buncombe County, has average annual precipitation of around 37 inches, and sits in the French Broad River basin. Shielded from the prevailing moist winds from the south and west by the Balsam and Smoky Mountains (where most of the rainfall is squeezed out), this area is the driest in the entire state of North Carolina. Elevation gradients also contribute to the various forms of precipitation the region receives. For example, lower elevations receive most precipitation as rainfall, whereas the tallest mountain peaks receive up to 50 inches of snowfall each year.